Caring for those with Alzheimer’s disease and dementia requires knowledge, experience, understanding and above all compassion. 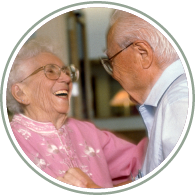 Our staff receive continuous training from some of the most skilled and experienced professionals providing memory care today. Compassion, combined with the positive attitudes of staff, drives the success of the program. 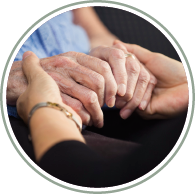 Our staff is trained to support the three key principles of assisted living as it relates to memory care: Offer choice, maintain dignity and promote individuality. In each senior living community, we offer residents choices in the services they receive by incorporating them and their family members in the process. Maintaining someone’s dignity is simple; Show respect, protect their privacy, and encourage independence. 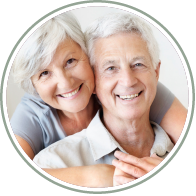 While resident’s have similar needs, each resident has his or her own likes and dislikes, routines, and lifestyles. Even when seniors live with others in a senior living community, they are individuals. We look for opportunities to help residents succeed at familiar tasks, whether it is making their bed or baking a sheet of cookies. These activities give residents the opportunity to experience the satisfaction of a job well done with the security of knowing a helping hand is always nearby.